The TWO shops in the Walker Art Museum suggested today’s Daily Dozen theme. How about some Maple Leaf sticky notes or a MadPax kids backpack that even I’d like to wear? The Museum of Russian Art is one of those places someone recommended and then you realize everyone is telling you about it. Where the Walker Shop is spare, the gifts in the Izba Gift Store are anything but. The painted mouse hugging its cheese would look delightful on my tree. Also in Minneapolis is the venerable Institute of Arts. Birthdays in my family all seem to happen at the same: spring, late summer, and Christmas-time. I can shop for everyone here. The Museum Shop stock reflects current exhibits, but always the most amazing art book selection in the city. 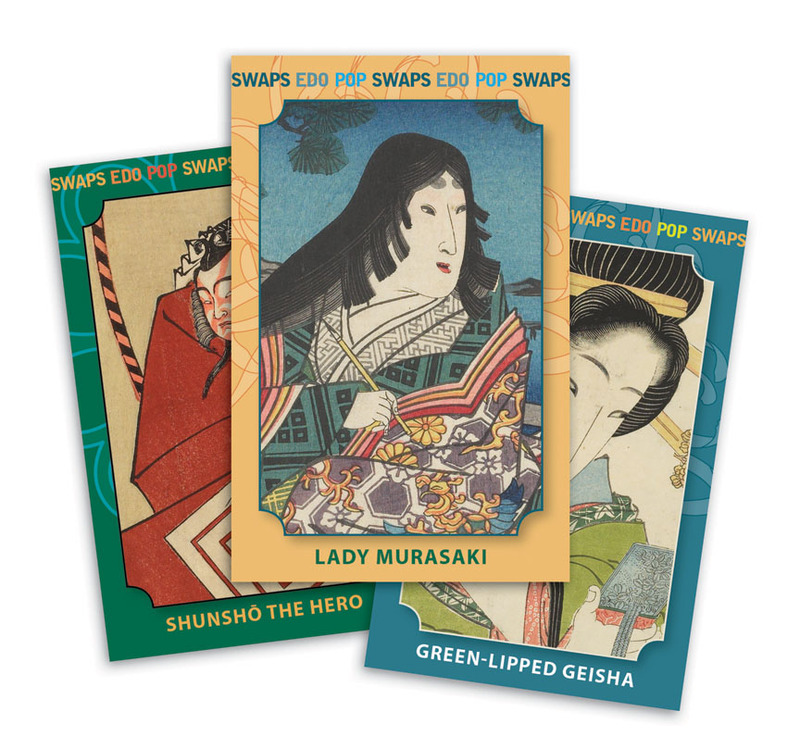 Edo Pop Trading Cards anyone? It’s pretty obvious that I love books. Have you ever made one? Or wanted to? Then visit the Minnesota Center for Book Arts. Sign yourself (or you and friend) up for a workshop and visit their shop for book-binding supplies. The Weisman Art Museum at the University of Minnesota is a gift just to drive by. I haven’t visited their renovated shop yet, but I’m planning to attend the “Annual Shopping Celebration” December 7th. Gorgeous work by local artists. A friend suggested the American Swedish Institute just to see their holiday decorations. The Museum Shop carries an amazing selection of Swedish handcrafts. I’m particularly fond of the felted wool balls and Klippan textiles. I’m a big fan of Santa. His train comes through the Jackson Street Roundhouse every December in St. Paul. You can find classic train paraphernalia in their shop, but really, the visit is a gift in itself. I found the American Association of Woodturners Gallery of Wood Art by accident last year. I was chaperoning a trip to the Winter Carnival and some of my charges needed a bathroom. We wandered around the Landmark Center for quite a while and discovered this treasure along the way. The Gallery Gift Store carries stunning turned wood bowls and kitchen implements for use and display. The Minnesota History Center also has TWO shops. Or maybe two separate rooms of the same shop. Either way, if you are curious about St. Paul — and who wouldn’t be, then you must buy The Street Where You Live which gives a the history of every street name in the city. Just so you know, Finn Street, just south of St. Thomas was named after distant relative of mine, once or twice removed. For cool toys, the Minnesota Children’s Museum store, Kid Spark is a must-stop. I was sad to see Creative Kid Stuff leave, but the museum created a great resource for birthday gifts. My daughter loves the polished stones and ribbon wreaths. For the bigger kids on your list, leave them at home and bop into Social Science at the Science Museum of Minnesota. For the 21+ crowd, Social Science is a lot like the Walker After Hours when they debuted in ’97: very cool, but still undiscovered. THEN visit the Explore Store Gift Shop. You can buy little bottles of precious metals and cool stuff relating to the featured exhibit. The Goldstein Museum of Design at the University of Minnesota St. Paul campus makes me want to back to school. You can take home a piece of a previous show – just buy one of their super-cool banner bags, from $20. Thirteen makes a baker’s dozen. A special shout-out to the Soap Factory, which hosted a $99 art sale in September. Let’s hope they repeat that event again soon! Don’t forget about them while they renovate through the winter. It’s just amazing what a rich life we have in the Cities! Most of these are not anywhere near as well known as they should be. Thanks for the list! Thanks for the shout out! We love our GMD banner bags!